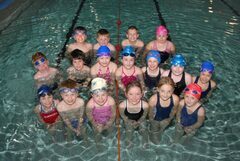 This Section of the Club is aimed at non-swimmers between 4 years old and 8 years old and takes place in the teaching pool on Mondays and Thursdays. When children are able to swim 50m or more, they can progress to the Swim Development group, swimming lengths in the main pool. Sessions are arranged over 12 - 14 week terms. Fees are paid a term at a time. Children will usually be considered for moving up at the end of the block of sessions (to start in the next block).